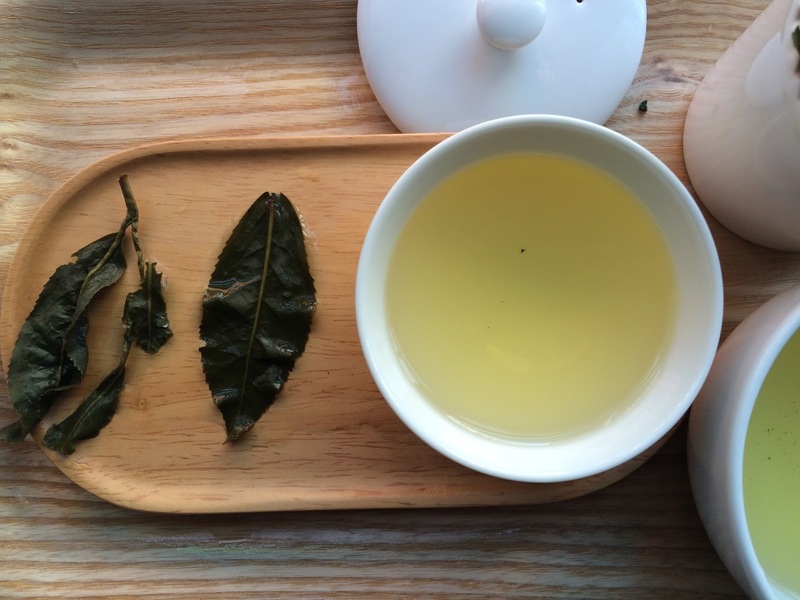 We are a brand-new online tea store specializing in Taiwanese oolongs. We travel to Taiwan ourselves to compare teas from the best tea farms before deciding where to source them from—which means every tea we offer has our personal stamp of approval. Our teas are always fresh, delicious, and free from artificial flavorings. Tea Ave will official launch in 2 days! Check teaave.com on March 1st for the grand opening. 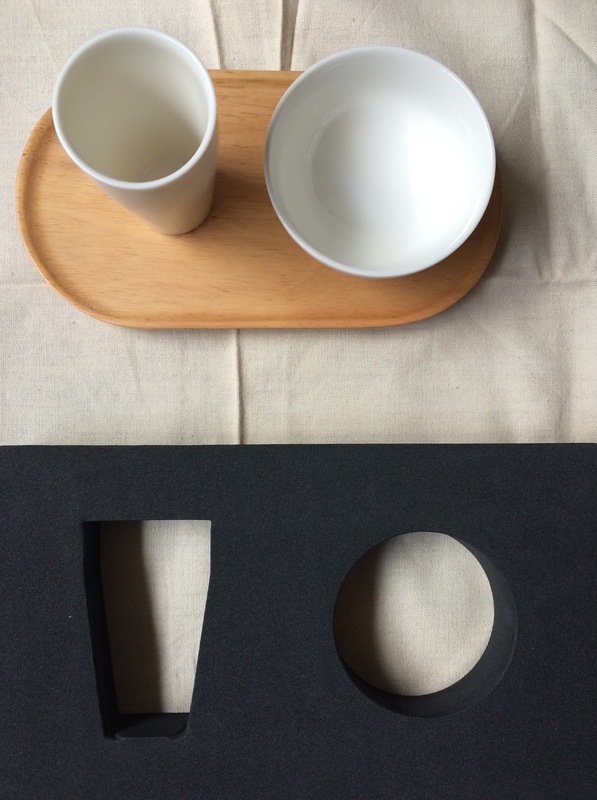 I received three oolong samples and a surprise (a small tray, an aroma cup, and a tulip cup). I also received a gift card; hello, more oolong. There was an unexpected surprise in my package too the details of which I will share next week, so stay tuned! 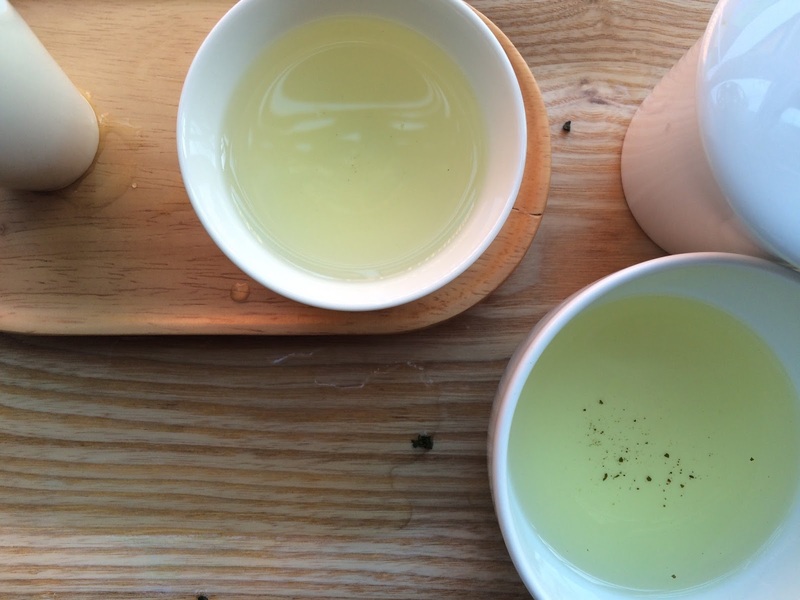 The oolongs are LiShan, Oriental Beauty, and new-to-me Wenshan Baochong. 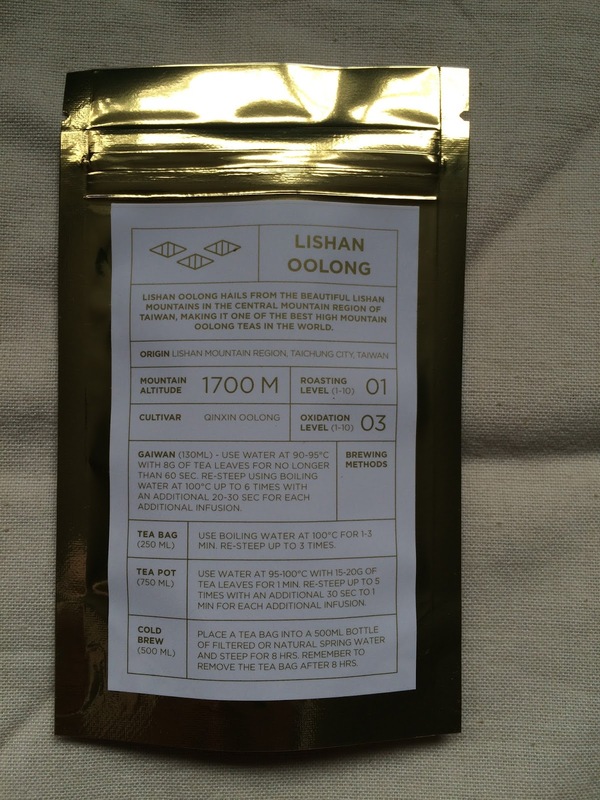 The LiShan as I mentioned at the start of the post was very good. I prepared it on two separate occasions, both times in my 130 mL tasting kit. When I rinsed the dried leaves, I poured that liquor into the aroma cup. I used the tulip cup from my tasting kit as a pitcher. 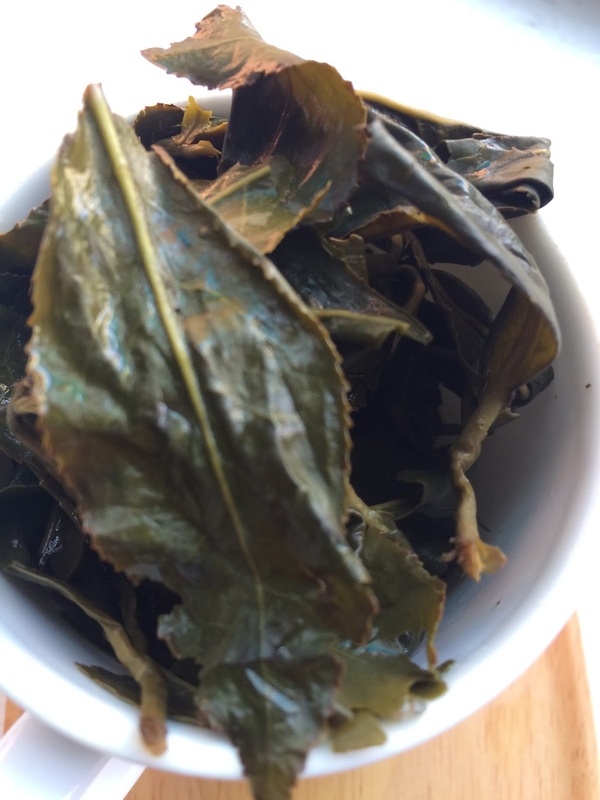 On the first day I prepared the LiShan, I loosely followed the instructions on the sample packet. By the way, the level of detail on each packet is unusual and appreciated. On the second day I prepared the LiShan, I strictly followed the instructions. I consulted My Japanese Green Tea for assistance with cooling my boiling water to the appropriate temperature. I don't have a thermometer nor do I have a variable temperature kettle. And I've never been able "to read the bubbles" in my kettle. Here are my notes from day two. I boiled a bit more than 130 mL of water then poured the water into a vessel and let it sit for 1 minute to cool down to 90-95 degrees C. I rinsed 2 teaspoons of dried leaves (approximately 8g (I don't have a scale)) then used the remaining water to steep the leaves for 60 seconds. The steeped leaves smelled like burnt sugar and dampened summer grass. The liquor was creamy, sweet, smooth, and tasted of a mild, white-fleshed fish (maybe seaweed?). 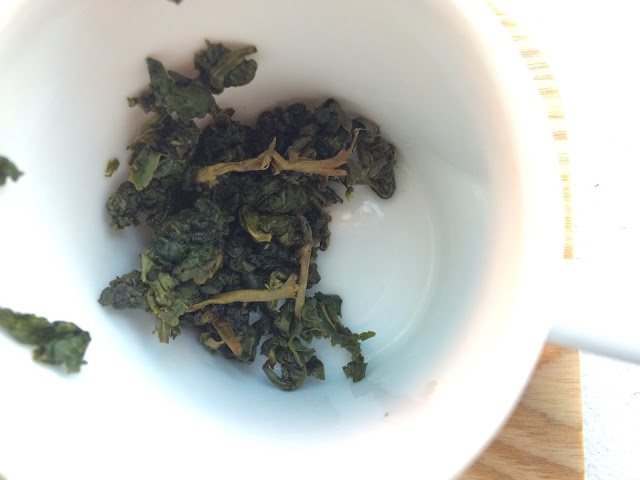 For the subsequent steeps, I used boiling water as recommended so I poured the water directly from the kettle onto the leaves in the tasting cup. The second steep lasted 60 seconds. The liquor had a bolder color and was drier than the initial infusion. I tasted pine and eucalyptus. The liquor was also chewy, like eating fresh bread. The flavors lingered in my cheeks and there was a bittersweet citrus note at the end. A sweet smell could be detected in the empty tulip cup. The packet recommended adding 20 - 30 seconds to each additional infusion so on the third infusion I steeped the leaves for 1 minute and 20 seconds. The liquor was noticeablely in volume and darker colored. I tasted and smelled a soapy, floral note which I associate with the flowers of the Callery pear tree. The liquor was more astringent than dry with a bit of stone fruit flavor. Think of sucking on the pit of a peach or apricot, not the taste from eating the flesh. The chewy texture remained as well as a lingering burnt sugar aroma in the tulip cup. I could drink this tea all day! After a 1 minute and 40 second steep, the liquor was still flavorful. It had a thick mouth feel with citrus notes, this time like a sweet red grapefruit thought with a slight bitter flavor in the back of the mouth. A 2 minute infusion! 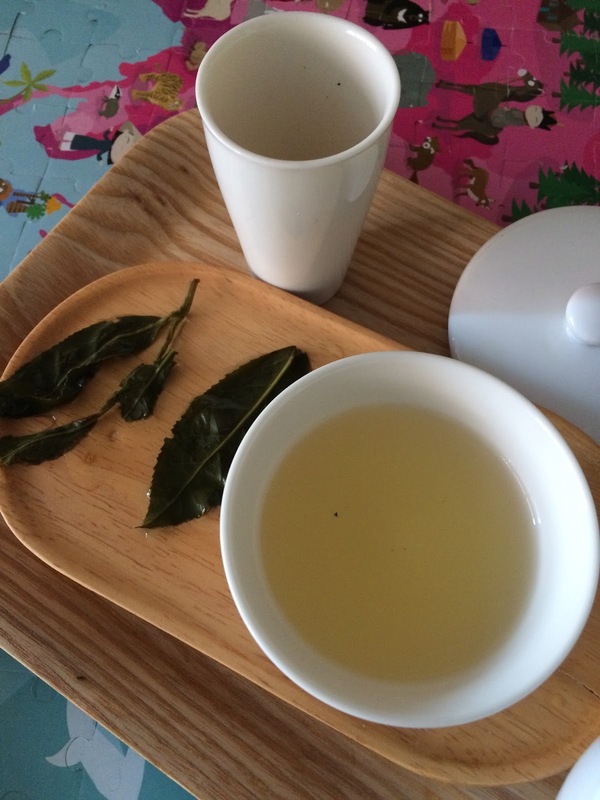 I think this was the longest time I have steeped leaves in a tasting cup/gaiwan set-up. The liquor had lost some of its complexity. Mineral flavors began to emerge. About two thirds of the original liquid remained in the pour. The color of the liquor was a brown yellow with a wet wood taste. The liquor was dry, no longer astringent, and the sweetness had evaporated from the tulip cup.